Exercising on a hard surface increases the strain on joint and muscles, which is why a comfortable surface is so key to a balanced workout. 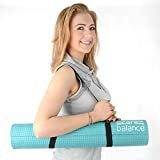 The Core Balance PVC Foam Exercise Mat is designed with comfort in mind. Made from spongy 0.6mm thick PVC foam, the mats help to lower fatigue and reduce the risk of injury so that you can work out for even longer. The mat has a special textured non-slip surface for greater grip, support and stability whilst stretching. This makes it easier to practice yoga positions that require a greater deal of balance. It also prevents the mat slipping on a smooth surface such as laminate flooring. Features: 0.6mm thick PVC foam. Textured grip for stability whilst stretching. Non-slip, lightweight and quick-drying. Shoulder carry strap included. Size (cm): L173 x W61 x D0.6.